What does it mean to be an underwriter? What is the process once my company registers? Is there a performance marketing model available? How can I communicate value/ROI to my team? WHAT DOES IT MEAN TO UNDERWRITE A BUYERS GUIDE? An underwriter is essentially a sponsor who also has a say in the content and voice of the guide. 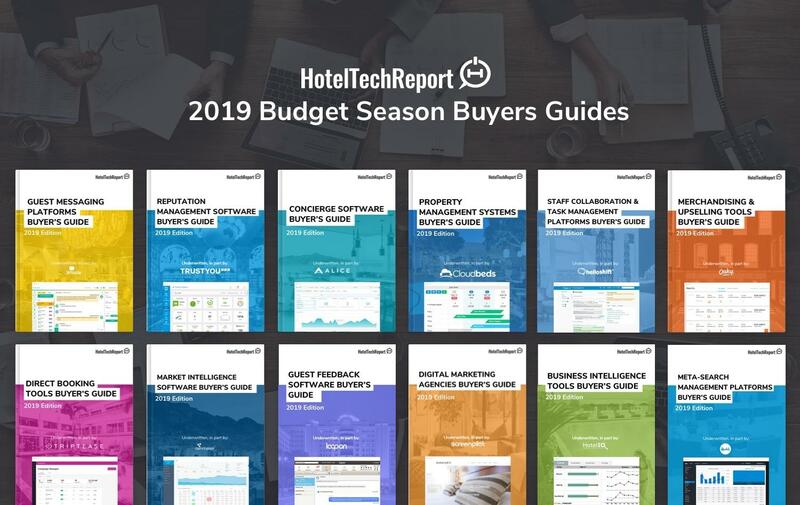 Each budget season Hotel Tech Report partners with top companies in each category to produce an annual buyers guide to help hoteliers learn the ins-and-outs of each critical category of hotel technology. Sponsored content: Turnkey content creation where you fill out a quick survey and we do the rest and output a finished co-branded report for you to use for your own sales/marketing and lead gen initiatives (eg. lead gen on your website, sales/marketing collateral, digital advertising, social media promotion...etc). Advertising/Promotion: Exclusive promotion of your buyers guide on Hotel Tech Report for a full year through next budget season. Your brand is featured in the following places for the full year through budget season next year (at no additional cost and no monthly): home page, category banner, category index. Easiest content you'll ever produce: Other than filling out a quick survey Hotel Tech Report handles the rest. We save your team the time and hassle of generating trustworthy lead gen content. Leverage the Hotel Tech Report brand: Other than being complex and time consuming, developing your own content comes with inherent bias and thus loses trust with prospects. Partner with HTR to remove the inherent bias of self promotional content that is developed and promoted internally. WHAT IS THE PROCESS ONCE WE REGISTER? While underwriters contribute their thought leadership and insights to shape the document through their lens, Hotel Tech Report does everything for you making this the easiest content your team will ever produce. We edit, design, publish: We take care of the rest, send you a draft for your approval. Revise/edit: Once we send you the first draft, your team may review, request additional brand placements and send us revisions. HOW MUCH DOES IT COST TO UNDERWRITE A CATEGORY BUYERS GUIDE? Sponsored content for your lead gen: Turnkey content creation where you fill out a short category questionnaire and we produce a polished co-branded report for you to use for your own sales/marketing and lead gen initiatives (eg. lead gen on your website, sales/marketing collateral, digital advertising, social media promotion...etc). A full year of exclusive promotion on Hotel Tech Report: Exclusive promotion of your buyers guide on Hotel Tech Report for a full year through next budget season. Your brand is featured in the following places for the full year through budget season next year (at no additional cost and no monthly): home page, category banner, category index. *Discount for Premium Members: Premium members receive 20% discount on buyers guide underwriting ($500 savings) To check category availability and register head to the buyers guide landing page. We do not offer a pay-per-performance model for buyers guides. For companies interested in performance marketing, you can learn more about our lead bidding program here. Exclusive promotion of your brand and your guide on HTR for the year: Think of this as advertising on HTR home page and category page for 12-months--so basically a $200/mo banner...which is like a single post in other industry publications. The buyers guide opportunities are meant to justify the cost whether vendors are interested in sponsored content for their lead gen, advertising to promote their brand or perks to enhance their presence and visibility online. Reach out anytime via the 24/7 on-site live chat, we're here to help!